MTI Trailer Advertising is a specialised outdoor mobile advertising in South Africa in all the metropolis areas of the country. Our value proposition is to expose your brands, products and services to the right target audience in a very cost effective way. Below are some of the reasons why we lead using this unique media platform. We are a dynamic and unique media company that helps companies drive strong Sales through Mobile Billboards to reach mass markets at a fraction of what it should cost. We can help your company talk to over 150,000 people daily and cover a greater geographic footprint than any other media resulting in stronger sales for your business and increased bottom line. We are always in the face of your target market by taking our branded Mobile Billboards to any requested event or location such as busy road intersection. The mobile billboards can be moved closer to event arenas of interest or any industry specific expo as per client’s request. Mobility gives you unlimited views per day. Providing an extensive reach with over 150 000 views per day. 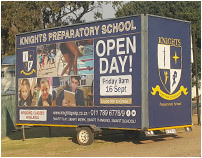 Our massive three sided (6m x 3m) mobile billboard trailers offers you 360 degrees visibility angle for maximum exposure to potential customers. Our advertising rates are very competitive in regards to tradition outdoor media platform. Kindly contact our sales team on the contact below for a comprehensive rate card.